What a fun new technique challenge this week on Split Coast! A Christmas Tree Box. Look here for the template and tutorial. I used two new sets from Artful INKables to decorate my tree box: Frosty Mug Mates and Paper Snow Flakes and you can get 10% off these stamps and everything else you purchase on Kristin's site by using the code save10JA so be sure to hop over there and save some money while buying those stamps you just have to have!! I also used bleach on the snowman and tree for my weekly Double Dare Challenge that I do with some SCS friends - Francie G was the hostess this week and using bleach on a card was her challenge to us. The way you do that is first you emboss the image - that sort of 'seals' the edges of the image. I embossed these images using black embossing powder. Then you use a small paint brush and dip it in bleach and 'paint' over the image and it will 'bleach' out the color of the card stock. Be sure to rinse out the brush as soon as you are done so the bleach doesn't eat the bristles! The bleach turned the card stock brown on the Hunter green tree and turned it white on the Baja breeze snowman. You can see the other bleached challenge cards here. I used some pretty silver ribbon from Papertrey Ink for my hanger. And I added red dew drops for a touch of color. The images are up on foam dimensionals. Instead of stars on the top (as per the tutorial) - I used showflakes that I cut out. 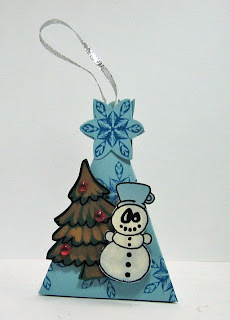 This side view shows how the flakes are attached to each other to form a circle - I put 3 together and just slipped them down the ribbon onto the top of the tree - you have to move them up to open the box. 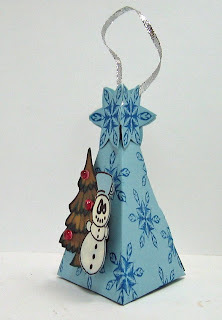 I hope you try one of these - they are really easy and fun to make! thanks for coming by to visit today! !